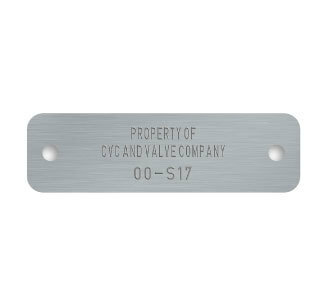 Stamped Stainless Steel Tags Round Corner .030"
Stamped Stainless Steel - .030"
Stainless Steel Tags Stamped Round Corner .030"
If selected, standard hole size is 1/8"
Permanent Black Fill Included in the price - After stamping metal tags and plates, you may choose to use Permanent Black Fill which blackens the stamped text to stand out for easy reading. Peel-and-Stick adhesive backer - Call for pricing - minimum 500 tags. Consecutive Numbering - Enter your number sequence in the text box about (i.e., 001 - 100). If your numbering is not consecutive or contains breaks, please call to place your order. Click here to view our fastener options for this product!